The mechanism of competitive substitutions was described in Predictions as a natural-growth process. 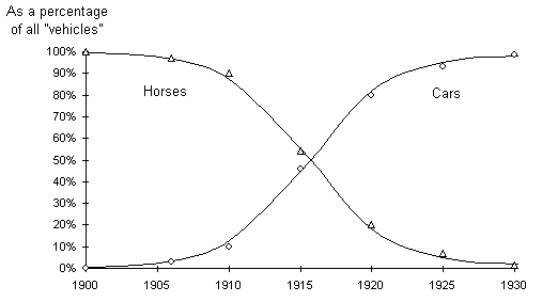 The classical example of cars substituting for horses in the personal transportation market showed how the market shares of horses and cars followed complimentary S-curves between 100% and 0%, the former going down and the latter going up, see Exhibit 3. Exhibit 3. The data points represent percentages of the total number of transportation units, namely, cars plus non-farming horses and mules. The S-curves are fitted to the data points. The sum of respective ascending and descending percentages equals 100% at any given time. Based on the principle that niches in nature do not remain partially full or partially empty under natural conditions, it is assumed that one-to-one substitutions proceed to completion, which seems to be the case with horses and cars. However, if we extend the tie horizon we find that the data deviates from the natural curves. I Exhibit 4 we see the cars-for-horses substitution in the logistic transformation that makes S-curves look like straight lines. 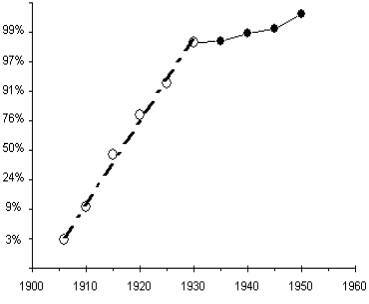 It is clear that whereas a perfectly straight line (intermittent line) describes well the bulk of the substitution process, the data points after 1930 (black dots) deviate significantly from the straight-line pattern. This deviation indicates that the number of horses that did not become substituted is much larger than the natural substitution process would have forecast. Exhibit 4. The logistic scale of the vertical axis makes S-curve look like straight lines. The straight line of the cars’ market share stops in 1930 beyond which date there are too many horses (black dots). In the cars-for horses substitution the deviation from the natural-growth process sets in after the substitution is 98% completed, therefore the deviation observed has little practical significance, but more often than not such deviations are much more important. Exhibit 5 is adapted from the celebrated article by Fisher and Pry who first suggested that one-to-one substitutions follow S-curves. I have updated the three substitution processes depicted in this exhibit with recent data (something not done in Predictions - 10 Years Later). Deviations from the straight-line patterns appeared well before the end of the substitution process. For synthetic rubber substituting natural rubber deviations began around 1980 when the substitution had reached 76% completion. For synthetic fibers replacing natural fibers deviations began around 1983 when the substitution had reached 72%, and for margarine replacing butter deviations began before 1980 when the substitution had reached 71.5%. I fact for all three substitution process the final settling level of substitution seems to be around 2/3 of the total. Contrary to what may have been expected from the law of natural competition, one-to-one competitive substitutions do not have to proceed to completion. A “locked” portion of the market share seems to resist substitution. In three publicized examples of natural substitution this locked portion was about 1/3 of the market. I have seen even larger such portions. The case of market value that shifted hands from IBM and Digital Equipment Co. to INTEL and Microsoft between 1984 and 1994 was a substitution process that proceeded to only 50%. Competitive substitutions are natural growth processes and do follow S-curves, but the final ceiling rarely is 100%. As disconcerting as it may be when you see a threatening newcomer begin to cutting persistently into your market share, there is no a priori reason to interpret his or her gains as a sign of an eventual take-all.